West, Kasie (2013-02-12). Pivot Point (p. 3). HarperCollins. Kindle Edition. As I open my bag of chips, Laila leans forward. “This stage isn’t very high, right?” What is she talking about? I follow her gaze to the ground. “I guess not.” “So it wouldn’t hurt too bad if someone got pushed off?” I look to the left, where several other regulars are lined up along the stage, lunches on their laps, feet dangling. “Who’s getting—” Before I can finish my sentence, she grabs my arm and flings me off the stage. I gasp in shock, wondering what evil plan this act has accomplished. I don’t have to wonder too long when Duke practically trips over me. “Are you okay?” he asks as I collect my scattered lunch. “Fine.” I shove my sandwich and chips into my ripped lunch bag and straighten up. “Addie,” Laila says, feigning concern and jumping down next to me. “Did you get hurt? What happened?” But her “concern” is instantly replaced with a smile for Duke. “Hey, Duke, we didn’t see you.” More like I didn’t see him. Laila quite obviously saw him from a mile away. West, Kasie (2013-02-12). 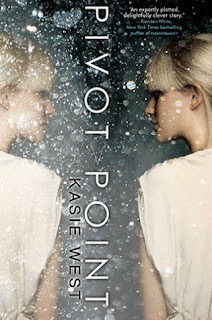 Pivot Point (pp. 59-60). HarperCollins. Kindle Edition. Nice teases! Been seeing this one around a lot lately!